Prague has become a popular travel destination and is known for its beautiful architecture, often drawing comparisons to Paris. So it’s not surprising that the city’s cat cafes are just as attractive. Residents (and visitors!) in Prague are awfully lucky because they not only have an abundance of feline emporiums to choose from, but they are gorgeous to boot. The Neighbor’s Cat visited all four of Prague’s cat cafes in September, 2017. The space that Kocici Kavarna occupies is dreamy and makes it a pleasure to sit and enjoy a cup of coffee while watching the world go by. The presence of cats is simply a cherry on top of this picture perfect sundae. The location, across the Vitava River a few blocks south of Old Town, is an easy 15 minute walk from the Charles Bridge. When I walked in, I was struck by how light and airy the front room was, accented with autumn decor. I placed my order for a latte at the handsome bar which was filled with tempting cakes. Unable to resist, I added a cat cupcake to my tab. In contrast to the front, I headed for the dark and atmospheric back room, where all the cats seemed to be, selected a cute little table and had a seat. With the antique decor and candlelight, it felt like the perfect place to spill a few secrets. There were several other visitors as well, and each had a kitty companion at their side. There are ten cats in residence at Kocici Kavarna and I found them to be endearing and friendly, but especially Sweetheart, a cuddly long-haired ginger who quickly found his way onto my lap and into my heart. My only criticism is that I caught the tiniest whiff of cat box every so often. Overall, my visit to this cat cafe was lovely in all aspects. The cats, the environment, the food/drink and service were all top notch, making a visit to Kocici Kavarna a wonderfully satisfying and highly recommended break when in Prague. 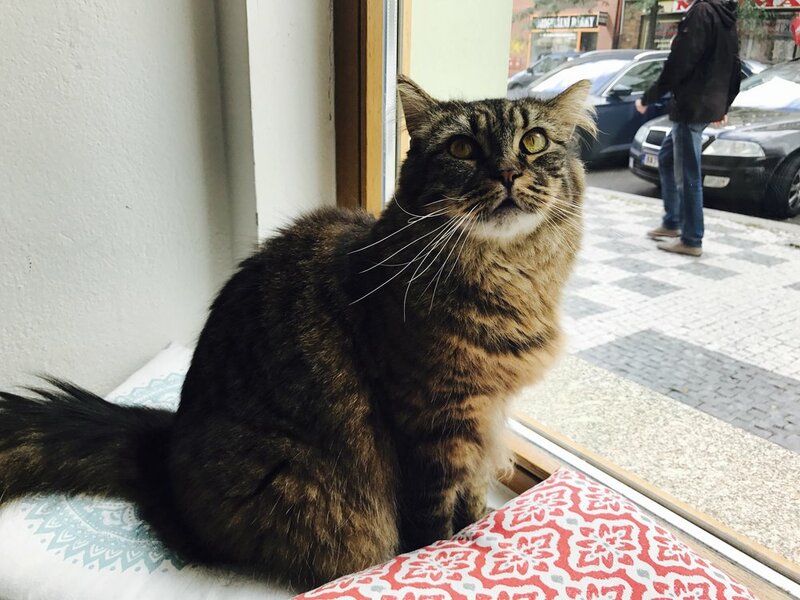 Prague’s oldest cat cafe is yet another beautiful place to sip coffee while enjoying the presence of furry felines. Located in the Zizkov neighborhood, a short distance from the main train station and Jiriho Podebrad metro stop, I felt right at home at Kockafe Freya as soon as I stepped inside. The set up is stylish and cozy, with just enough space between tables to feel communal, yet private for conversation. I was coffee-ed out by the time I arrived at 4 pm and being a Friday afternoon, decided to order a white wine and some nibbles for the super low price of 80 crowns ($3.65 USD). As I listened to indie music, the cafe’s seven cats (all rescues) curiously and quietly roamed the room switching places for their next nap, which is when I noticed the adorable merchandise featuring these kitty celebrities. During my hour-long visit, a mix of tourists and regular customers filled the cafe, and we received great service from the friendly manager who clearly adores the cats and enjoys running this lovingly crafted space. Kockafe Freya has a hip and relaxing vibe that I found irresistible and strongly recommend a visit when in Prague. Kavarna Kocici (not to be confused with Kocici Kavarna!) is another lovely place to enjoy a latte in the company of cats. Adjacent to the Old Town (between Florenc and Krizikova metro stops) I stepped into this bright and cheerful cat cafe after a pleasant walk through the Karlin neighborhood. There are two levels- the basement is cozy and atmospheric, I decided to sit upstairs where most of the cats were hanging out. There are nine felines living at the cafe and while they are social and enjoy sitting near you, are not as keen on being petted. I hung out with Skorice, who sat in a nearby window and came around to sniff me every so often. The menu contains the bios of all the kitties, so you can learn their names and personalities. I suspect as a regular, you would make feline friends in no time! I ordered a latte for 65 crowns ($2.96) which was high quality and nicely presented. The cafe also serves a variety of cocktails and food- sandwiches, soups and cakes. In speaking with manager Zuzka, she stated they had been open for three years and were shifting to an eco-sensitive concept with decomposable cups and vegan/raw food. Located in New Town, just adjacent to the tourist mecca of Old Town, the vibe of Cat Cafe Prague is definitely ‘make yourself at home’. Spacious, with plenty of cozy couches, adorable felines and an all-you-can-drink coffee bar, you might be tempted to stay all day, but remember you are paying an hourly rate of 99 crowns ($4.51 USD). I was greeted in English by the friendly host, who explained the rules, including replacing shoes for slippers and hand washing, something that is common in Japan, but rarely implemented in western cat cafes. He also provided a quick tour of the facility, showing me the cat room, video game room, lounge and kitchen area where I was told I could help myself to as much coffee, tea and snacks as I liked. He noted there are eight cats, all rescues, including two small kittens. The cafe tries to select cats that are fairly social and will adapt well to the environment. With cat on the brain, I started in the ‘cat room’ so-named for the plethora of toys and cat equipment it contained. I focused my attention on a playful young kitten that never tired of chasing a string and diving through a nylon tunnel. Next, I moved to the colorful and comfortable lounge where I made eye contact with a cat whose name I later learned was Kenzo. I sat still on the couch until he hopped up on the armrest next to me and proceeded to nuzzle my neck until I thought I would die from kitty-induced euphoria. It was one of my best cat moments in a cat cafe. I didn’t spend any time in the video game room with its big screen and Playstation set up, but I liked the dark and atmospheric space. Between photographs, sipping coffee and playing with cats, my hour went by very quickly. The beverage and snack bar was not something I had seen before. It was a nice touch, although everything was fairly basic. Cat Cafe Prague isn’t as pretty as the other three cat cafes in town, but with a clean, cozy space, friendly staff, and the prospect of getting some kitty love from Kenzo, I recommend popping in when in Prague. The Neighbor’s Cat is the alter ego of Paula LaBine, an itinerant cat lover who writes about cat cafes, cat travel and rescue/adoption. She is visiting every cat café in the world, 200 in 29 countries so far! Find her at theneighborscat.com or on Facebook/Twitter @catcafeviews.